Scot Smith, 38, of Warren, passed away peacefully at his home Sunday, December 24, 2017. He was born on July 18, 1979, in Galveston, Texas, to Sandy Simon Smith and Gerrell Roy Smith Jr. He grew up in the Lumberton area going camping and fishing with his parents and two brothers. While living in Lumberton he met his love, Misti Key, and they got married on April 15, 2000. They had three incredible children, Seth, Christi, and Jesse James. After the birth of their third child they decided to make their home in Warren, Texas. Scot spent a few years working for CSA, a sign shop, and then with the help of his brother-in-law began a career in electrical work, where he ended up being a journeyman for ESS in Silsbee. 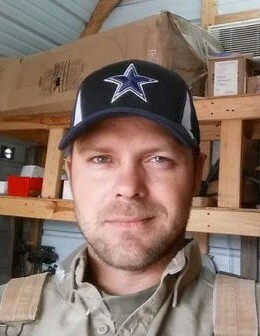 Some of Scot's favorite things to do was hanging out with family and friends around a fire, playing washers, riding horses or side-by-sides, watching the Cowboys or the Warren Warriors play, and playing Monopoly with his wife and kids. He was a great friend in times of need, a loving and supportive husband, a wonderful father, son, grandson, brother, and uncle. He was a blessing to all who knew him. He is survived by his wife, Misti, children, Seth, Christi, and Jesse of Warren; his father, Jerry Smith of Lumberton; his grandmother, Helen Smith of Silsbee; his brother and sister-in-law, David and Melanie Smith of Bevil Oaks; his baby brother and sister-in-law Jerry and Julie Smith of Beaumont; several nieces and nephews whom he loved very much. He was preceded in death by his mother, Sandy Smith. On Saturday, December 30th, the family will have a story sharing and visitation time from 1-3 to be followed by a Memorial Celebration of his life at Happy Valley Church located at 4069 Villa Rd. Kountze, Texas 77625. Per the family's request, in lieu of flowers, donations can be made for his children's education, outstanding medical expenses, or to further pancreatic cancer research in the name of Scot Smith at the UT Health Northeast in Tyler, Texas.